Your Next Stamp May After Release Party Post! Hello! So how did you guys like the Your Next Stamp May release? Super cute as always, right? I am just loving all of the new images, and the dies~FABULOUS!!! For my card today I used another one of the adorable birdie images called Flower Bush Robin. I just adore these darling birds:) I also used the YNS Fishtail/Banner Dies for my sentiment which comes from the Handwritten Sentiments Set. (I just saw that the Fishtail/Banner Dies are on sale for $12.00!!!) I also used the YNS Whatnots Die Set ~ Groovy 70's for the flowers. The dp is Echo Park Paper Co. Bundle of Joy and the layout is the Deconstructed Sketch #95. SUPER CUTE colors!!! It looks just like your blog header!! :) :) :) The new line is adorable! I grabbed up a few birdies and the sale fishtail dies!! ahhh this is beautiful and love the colours! 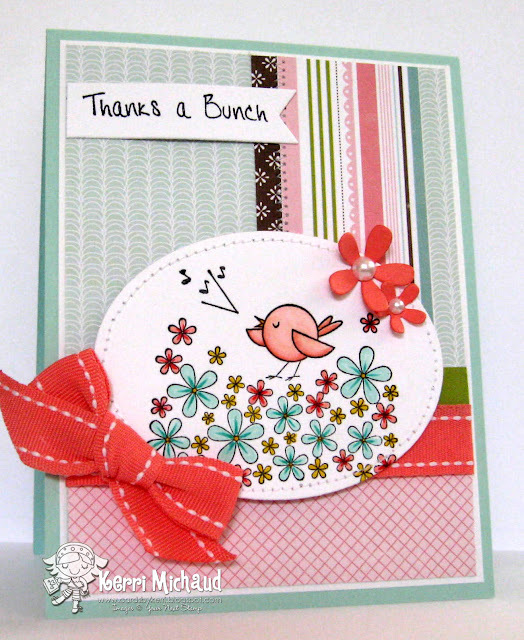 Super cute and cheerful card!! :) Such a cute image, too. Really cute card I am loving this bird. The flowers are so spring-e I love the look and the papers are wonderful.